This Stationary Hard Wood Crap Table is Available in a Range of Colors and Sizes. Our beautiful Wooden Casino Style Crap Table is made of durable Oak wood. The Craps Table features slab wood legs, a two-row routed wooden chip tray, a removable padded arm rest, a padded modern Craps Layout, a rail rubber lined and mirrored interior, and more. The walls of each Craps Table break down for easy portability and storage. No tools are needed for the quick and easy reassembly of this Craps Table. The table reassembles with latches and wing nuts - once the Crap Table is put back together, you can't tell it was ever broken down! With its high quality, detail-rich craftsmanship, this U.S.-made Craps table will make an excellent addition to any game room. Four Crap Table sizes are available: 8' x 5', 10' x 5', 12' x 5', and 14' x 5'. 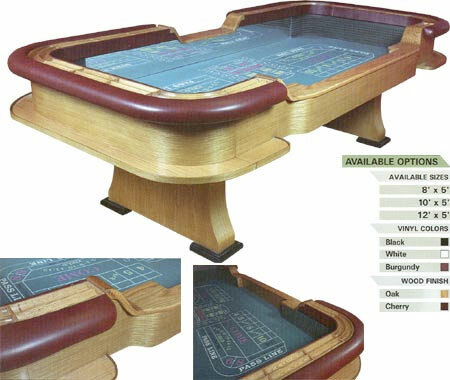 For additional information on our Casino Style Crap Table with Slab Legs, please contact us at 1-800-233-0828. You might also be interested in our Casino Style Craps Table with H-Style Legs, our One-Man Craps Table, and our wide selection of Craps Supplies.